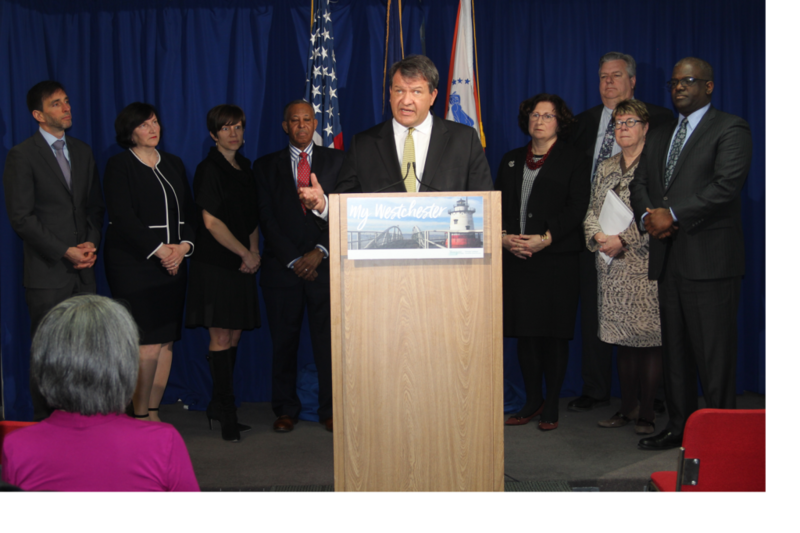 Westchester County Executive George Latimer was joined at the press conference by county legislators as well as New Rochelle Mayor Noam Bramson and White Plains Mayor Tom Roach. WHITE PLAINS—Westchester County Executive George Latimer said at a press conference on Monday the county is hopeful Con Edison will delay the implementation of its moratorium on new gas connections for most sections of the county that is set to begin on March 15. Fearing the potential dramatic impacts the moratorium could have on the billions of dollars in new development projects in the pipeline, County Executive Latimer said that he is hopeful the utility will agree to delay the implementation date of the new natural gas connection ban that was announced by the utility on Friday, Jan. 15. Latimer at a press conference held at the Westchester County Office Building said that he has asked Westchester County Director of Operations Joan McDonald to contact New York State Public Service Commission Chairman and CEO John Rhodes to encourage Con Edison to delay the moratorium so the county could develop an action plan to deal with the impacts of the moratorium. The County Executive confirmed that the county and state elected officials held a meeting with Con Edison executives last Thursday. The meeting, held at the Con Edison offices in Rye, was a fact-finding session to learn the reasons behind the imposition of the new natural gas connection moratorium on all of lower and central Westchester County. The ban will impact projects yet to break ground in Yonkers, New Rochelle, Mount Vernon, White Plains and other municipalities in the affected areas. Projects that secure work orders for natural gas connections from the utility prior to the March 15th deadline will have two years to complete their projects, according to New Rochelle Mayor Noam Bramson, who said at the press conference he hopes some modifications can be made to extend that two-year deadline. Latimer, other county government officials and Mayor Bramson and White Plains Mayor Thomas Roach, all said they believe that viable solutions to the energy supply problem in Westchester can be found. However, all cautioned that if the moratorium were to last for an extended time it could have dramatic impacts on the Westchester County economy. “The cities of Westchester County are going through historic renewal and it is years of painstaking efforts that put us in this position,” Mayor Bramson said. “To receive this sudden news from Con Edison is potentially very problematic— but I am confident that all of us working together can achieve a solution.” Mayor Bramson said that there are currently $4 billion of new projects contemplated in the Queen City. 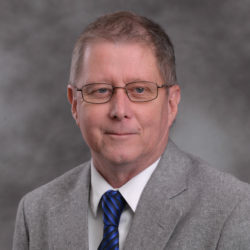 In addition to requesting a delay in the natural gas connection moratorium beyond March 15, the county is compiling a full list of projects and their timetables for construction to determine the moratorium’s true impacts. The county will also hire energy consultants to advise county and local governments through the regulatory process and to determine the responsibilities and powers of the New York State Public Service Commission for example. Other initiatives announced by Latimer call for the county’s director of energy & sustainability Pete McCartt to conduct a survey to explore how the county can reduce gas usage at its facilities and to work with the business community, and other entities, to help them navigate the moratorium and how it relates to development. Latimer also said that he will testify at an upcoming hearing of the New York State Public Service Commission scheduled for sometime next week. Con Edison released a statement in response to the county’s planned request for a delay in the natural gas connection moratorium that at least on the surface seemed to indicate a reluctance to change the March 15th implementation date. “We understand the difficulties the temporary natural gas moratorium may present to new customers. The moratorium is needed because of gas supply constraints on interstate pipelines, which limit supply deliveries to parts of our service area on the coldest winter days,” Con Edison stated. “We continue to work with our customers to help them find other options including clean energy alternatives and our Smart Solutions program. We are committed to helping the state achieve its environmental and energy goals. In addition to the PSC scheduled hearings on the moratorium scheduled for the week of Feb. 11, the PSC will also hold a hearing on Feb. 7 to discuss Con Edison’s Smart Solutions program. The $305-million program includes measures to offset peak-day gas demand through a number of different measures including the construction of natural gas storage facilities that would accept fuel transported by trucks into the region. Perhaps in a case of bad timing, on Jan. 31, Con Edison announced its request to the Public Service Commission for rate hikes. The proposal seeks an additional $485 million to run the company’s electric delivery system in 2020 and $210 million for the natural gas delivery system. The monthly electric bill for a New York City residential customer using 300 kilowatt hours would increase $4.45 to $81.78, an increase of 5.8% (8.4% for delivery). The bill for a Westchester County customer using 450 kilowatt hours would increase $6.10 to $114.04, an increase of 5.7% (8.5% for delivery). For a typical commercial customer using 10,800 kilowatt hours with a peak demand of 30 kilowatts, the monthly bill would increase $80.96 to $1,970.67, an increase of 4.3% (8% on delivery). The average monthly bill for a residential gas customer using on average 100 therms per month would increase $17.28 to $176.34, an increase of 10.9%, or 15.8% for delivery. The Business Council of Westchester, which has established a task force in response to the natural gas connection moratorium, met with Con Edison officials on Monday afternoon to discuss the issue. The session brought together more than 50 leading developers with projects planned for Westchester. The two-hour, closed-door session facilitated an open, wide-ranging discussion of the natural gas supply shortage situation, which poses a real threat to the future of economic development in most of Westchester including its major urban centers, the Business Council reports.. Developers representing a cross-section of smaller, mid-sized and large companies, as well as affordable housing advocates, joined in the conversation and endorsed the BCW’s implementation of a task force to immediately begin exploration of both short and long-term ways of addressing the issue. The BCW task force will begin work immediately and will include outreach to local, county and state leaders to work together to address the immediate and long-term situation, and has scheduled major energy conference in May.